“I came on a mission to shock people,” Amy admits. “Rachel and I would hold hands in front of people, but instead of the disgusted looks of contempt we expected, people met eyes with us and treated us like real people. So we started coming to church weekly. We kept moving closer to the front each week, trying to get a reaction so that we’d be rejected sooner rather than later. When we couldn’t shock people, we stopped trying and started learning. “Not long after that, Rachel and I stopped seeing each other, but I kept coming to church because I was searching for something. I definitely wasn’t looking to change. It wasn’t my lesbian lifestyle that I was bringing to God, but I wondered if God had answers to my deeper longings. Problem was, I didn’t trust God at all! Amy continued to grow in her knowledge of the Scriptures, falling more and more in love with the Lord. The following year, God had another surprise for her: “I went to the seminar called ‘To Be Told,’ hosted at Gateway. I wanted to see how God could put closure to my brokenness, but what he showed me shocked me,” Amy recalls. “As Dan Allender was telling a story of a bully, I suddenly had a flashback of getting off the school bus. I lived down the street from Jimmy, a boy who had bullied me all year. But this particular day, Jimmy acted nice to me as I got off the bus. Seven years later, Amy leads our ministry to help people find healing and wholeness from all kinds of sexual and relational struggles. She’s helping others become God’s restored masterpiece. 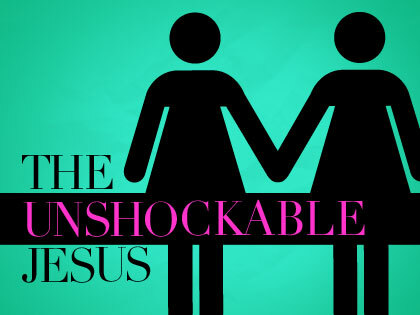 Do you realize that Jesus is not shocked by the shocking things people do? Jesus knew Zacchaeus had robbed people blind and profited off much unethical behavior, yet Jesus was not shocked. He did not offer Zach correction, but relationship. “Come down, Zacchaeus. I’m staying at your house tonight” (see Luke 19:5). That shocked everyone! Yet relationship changed Zacchaeus. Jesus knew that the Samaritan woman at the well had been married and divorced five times. He knew about her current “hookup” and how sexually entangled she was with the guy she was living with (John 4). Jesus was not repulsed. (Samaritans of Jesus’ day were treated by the religious community like gay people often get treated by some of today’s Christian community.) None of this kept Jesus away or kept him from offering her living water. Maybe Jesus wants Christ-followers who will be less like the Pharisees and more like him—unshockable. Luke tells of a time Simon the Pharisee invited Jesus to dinner. Jesus and his disciples went and “reclined at the table” (Luke 7:36) along with Simon’s religious friends, who were skeptical about Jesus’ true identity—mainly because he showed more love for “sinners” than love for the Law of Moses (Jesus had just made it clear this wasn’t true; he came to fulfill the intent of the Law of Moses). They invited Jesus there to judge him, not learn from him. Middle Eastern dining style consisted of a one-foot high table with pillows on the floor for seating, usually with feet stretched out to the side or behind them. As the meal proceeded, an immoral woman crashed the party. She sheepishly made her way over to stand behind Jesus. Luke makes sure we know she had “lived a sinful life” (v. 37). She did not just have a few slipups, but rather had made a life out of her sexual deviancies, and everyone knew it! Her mud was public knowledge. Her whole life, she had felt judged and condemned by the religious establishment, so to go into the house of her tormentors took enormous courage. Yet there she stood . . . because Jesus was there! Somehow word on the street had traveled to her through the crowd she hung out with—there’s hope in Jesus for the muddiest human. Hearing he had come near, an unstoppable force welling up from within had drawn her to his feet. As she stood in his presence, hope burst through the dam of all that pain that had driven her mudslinging behavior—she started to cry. Her tears accidentally landed on Jesus’ dirty feet (that his host had not shown the common courtesy to wash). The tension in the room mounted; everyone’s shoulders tightened as she fell to her knees behind Jesus, bent down, and wiped his wet, dirty feet with her hair. She took out a bottle of oil mixed with perfume, took the oil in her hands, and gently stroked his feet with the oil—kissing them as she anointed him with the perfume. Simon could stand it no more. This outrageous scene had proven his point. He muttered to himself and his “more respectable” guests, “If this man were a prophet, he would know who is touching him and what kind of woman she is—that she is a sinner” (Luke 7:39). In other words, if Jesus were truly a prophet, he would know about her scandalous sexual sin, and he would be shocked. But Jesus did know and was not shocked! Now you have to realize, this was a controversial situation. Imagine a known prostitute coming up to your pastor, kissing his feet and rubbing oil on them after the Sunday service. It would be his last Sunday at most churches if he didn’t put an end to it fast! What was Jesus thinking? Why didn’t this shock Jesus like it would all of us? It’s all about love! Don’t miss this very critical point Jesus makes to us all—if you truly recognize how much it cost God to forgive you, it will flood your heart with love for God and others who need more of the same. It’s all about love! Not a love that ignores the mud and the damage that destroys God’s Masterpiece, but a love that recognizes how much loving mercy God has given a messed up person like me! That great love brings grace and truth together to give hope to a broken world in need of forgiveness and restoration. Excerpted from John Burke, The Mud and the Masterpiece, Baker Books, a division of Baker Publishing Group, 2013. Used by permission.